Let's get you feeling Merry INSIDE and OUT! Partnering with other indie businesses to get you ready for the holidays. 'Tis the season to help support each other, and BRYN+MCKENNA is collaborating with other small indie businesses with fun style tips for feeling good inside and out. There is no better time than the holidays for taking our look up a notch with stunning handcrafted jewelry, cutting-edge makeup products, and soothing essential oils for balance. We love our indie biz pals and we all want to help each other grow and be successful, while helping you to be your most fabulous self! We're so excited to work with the amazing Kaysha Nyman, a trending makeup artist and beauty consultant shown here wearing our B+M 'Grace Upon Grace' Necklace. This design is full of meaning with five little brass rings as the focal point. Brass represents the natural good and well being, and the five rings symbolize 'grace upon grace' for a dynamic, energetic, and independent mind and soul. 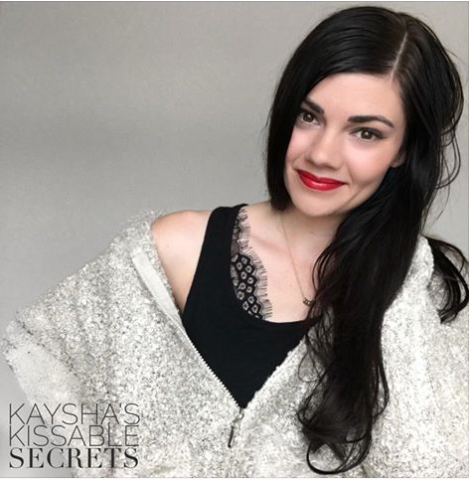 Kaysha is the go-to goddess for news, info, and tips on cutting-edge makeup trends and application for a long-lasting gorgeous look for the holidays and beyond! We all know the importance of applying skincare at nighttime, but a morning routine is just as crucial to get your skin prepped and ready for an all day flawless application to your makeup. Nighttime skincare focuses on skin issues before the regenerative process of sleep begins, but daytime skincare is all about protection and preservation. You can’t create a youthful complexion later on, you can only maintain the one you have now. I'll be the first one to admit: MORNINGS ARE HARD! Seriously, count me lucky if I can brush my teeth before getting out the door in time. While most of us know that, as a minimum, we should slap some SPF on our skin before heading out into the day, fewer of us are keyed into the idea that other airborne nanoparticles (like smog, cigarette smoke, soot, pollen, water droplets, and pollutants) contribute to aging skin. Applying daytime skincare properly will clean your skin and arm it with antioxidants (then UV protection) to ensure you're really ready to face the day! 1- To start your morning off right you will want a good facial cleanser. Senegence offers cleansers and skin care for dry, normal to dry, normal to oily, or oily to acne skin types. 2- Once your skin is washed and dried, apply a moisturizer. Senegence offers a product called climate control that is hydration in it's purest form. It is made of the smallest molecular weight and delivers pure seneplex complex with anti-aging ingredients, natural oils, and beneficial ingredients for cellular repair to the skin at the deepest level. 3- Did you know that the skin around your eyes moves the MOST on your body (except for your lips)? We are constantly blinking and squinting causing continuous movement. A good eye cream can help protect your eyes and fill in lines and wrinkles while fighting signs of aging. Senegence offers EyeLuminator that includes MakeSense pearlizer to give your skin an extra healthy glow. This is one of my VERY favorite products in my morning skin care routine! 4- Apply a primer prior to your foundation to get that all day wear for the holidays! Silk offered by Senegence is a pore and wrinkle minimizer to help your makeup go on smoothly and makes it look flawless. It comes in an air pump bottle so you get every last drop of product and a little bit goes a long way! Thanks KAYSHA for rockin' the OUTside with a sleek and polished finish is all about the prep. We're talking the right foundation and contouring that sets the stage for the most fabulous version of YOU! Our exciting collaboration with Senegence beauty products and our very own B+M Designer, Nancy Peters, showing off her Moca Java Shadowsense for amazing contour, and Mulberry Shadowsense blush for the perfect hint of color to accentuate the cheekbones. Complete your party-ready look with Eyesense eyeliner, Moca Java Shadowsense eye shadow, and Fly Girl lipsense for a stay-put pout that does not kiss off, smear off, or rub off! Now, let's get ready for those G-L-A-M Eyes. We're obsessed with Senegence products! We love our busy and unpredictable lives, but we want makeup application to be one and done from brunch to happy hour. They're smudge-proof, water-resistant and you won't need to reapply throughout the day...Yay!! LashExtend- get those long lashes you have been dreaming of in a natural way! Apply prior to your makeup or as part of your nighttime skin care routine. SeneDerm® Solutions LipVolumizer- LipVolumizer works to increase collagen production in your lips which enhances fulness, adds moisture & decreases fine lines and wrinkles. Apply prior to makeup or as part of your nighttime skin care routine (1-2 times a day for best results). LOOKING AHEAD...Stay tuned next week for tips and advice on how to get us ready for feeling great on the INSIDE! Our wonderful and soulfully inspired essential oils expert Rosemary Noe will let us in on her very own HANG OVER CURE! It's so important to stay balanced, focused, and relaxed, keeping that holiday mood joyful and as stress-free as possible. We can't wait to share her ideas with you!